The reaction between diisocyanate and diamine to form polyurea can be very fast. The exothermic heat in turn pushes the reaction to completion. No complicated reactor nor strict conditions are necessary. This behavior makes it possible to mix these two components together by calculated ratio and apply the resulting mixture onto a substrate. Different thickness of tough polyurea coatings, can be applied anywhere on various substrates. In practice, a high pressure spraying equipment is used to apply a polyurea coating by uniformly spraying the material on the surface. This is the base of fast-setting polyurea spray systems. The fast-setting Polyurea Spray Coatings serve various industries and markets. The common raw requirements have low viscosity, low freezing point, and relatively high fast reactivity. These raw materials must produce a high-strength, thin layer for its protective purposes. Gantrade provides additional raw material choices which can improve product performance or offer viable solutions for many new applications. The customizable nature of polyurea spray systems makes them an excellent choice for a diverse range of applications. This blog’s intention is to start and encourage discussions about improvements to the existing systems and formulating new ones with enhanced performance, durability and lifetime. Construction industry, for erosion protection, concrete surface protection and waterproofing. Manufacturing industry, for surfaces protection. Water industry, for storage tanks and pipeline corrosion protection. Chemical industry, for processing vessels’ corrosion protection and chemical-resistant tank liners. Concrete industry, to provide floor sealers, protective coatings, surface repair, or waterproof surfaces. Military industry, for outdoor dwellings reinforcement. Oil and gas and coal mining industries, for abrasion resistance and corrosion protection. This list represents only a small sample of a large number of industry uses. Polyurea Spray Coatings can be used for different purpose even within a single market niche. For instance, a railroad company may use one polyurea system to prevent an aggregate from damaging the surfaces of railcars on impact and use a different system to prevent corrosion of other metal surfaces. Enhancing the strength of a part or protecting surfaces from wear and tear, like in truck bed liners. Waterproofing surfaces of a swimming pool or a reservoir. Protective coatings for wood surfaces to prevent scuffing and scratching. Reinforcing fabrics or padding for durability, such as roofing materials and military garments coatings. Softening or hardening a surface, such as a tabletop, with a spray-on coating for a softer feel or improved impact resistance. Protecting tunnel surfaces from impacts and blasts. Providing environmental and rust protection for metal surfaces. From small, spray coated fracking aggregates to large-spray coated mining or highway passages, there is a vast number of applications where polyurea spray coating systems are being used. 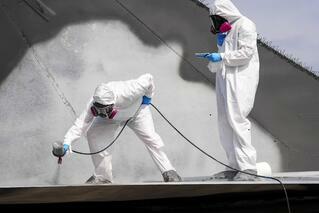 Spray coatings for truck-bed liners or concrete-mixing tanks liners. The potential for polyurea spray coating applications is ever expanding. Choosing the right spray polyurea system will ensure a long-lasting surface protection for many different applications, regardless of the shape or size. The finished layers of fast-setting polyurea spray coatings can have a different hardness, depending on the formulation. They can be a foam or elastomeric, clear or colored, matt or glossy, hard as glass or softer than rubber, structured with fillers or a very thin film. It simply depends on what are the requirements of a particular application. A distinct form of polyurea spray coating and environmental-resistance properties can be achieved by choosing different chemicals or their combinations. Though all spray coatings are applied in a similar way using high-pressure spray guns, longer gel-time formulations can be applied with rollers. Altering the formulation enables customization for a specific application. The environment, intended function, hydrolytic resistance, static or dynamic nature of the application, thermal shrinkage, operating temperature range and other variables should all be considered for an adequate material selection. What kind of protection is required? Does the application require impact or abrasion resistance? What type of abrasion is predominant: sliding or impingement? Is the nature of the application static or dynamic? Is resistance to direct sunlight and UV exposure important? What is the expected operating temperature range? What kind of chemical exposure should be expected? Is hydrolytic resistance important? Operation in hot and humid environment? For instance, a bathroom tub application will require different formula than a swimming pool application since the latter requires more UV resistance and chemical (chlorine) resistance. However, those formulas will be quite different from the abrasion-resistant coating needed for a fracking slurry pipe liner. Yet all three applications need good hydrolytic resistance. DETDA, DMTDA, MBOEA, P-1000 and liquid curative formulations. Gantrade’s BDO, MPO, a wide range of polyether and polyester polyols for use in spray polyurethane MDI-based systems, offer excellent hydrolytic resistance, good dynamic performance, and food contact compliance. With the wide variety of raw materials from our production partners and the help of our high-quality toll partner, we also provide commercial quantity liquid, low-viscosity diamines and/or diols formulation systems to create various properties that meet your customers’ needs. The Gantrade technical team can provide assistance with finding a fast-setting polyurea spray system that decreases workload and increases the longevity and durability of your products. Contact Gantrade to receive support from one of our representatives in North America, Europe, or Asia.